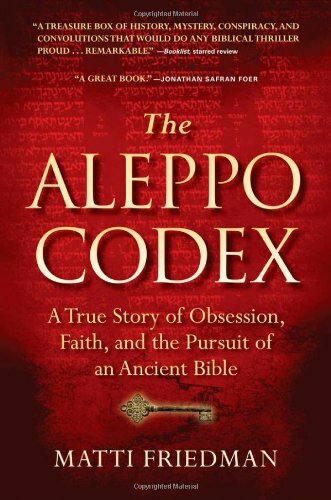 Our book group enjoyed a very spirited discussion about “The Aleppo Codex: The True Story of Obsession, Faith and the Pursuit of an Ancient Bible,” written by Matti Friedman, a journalist who painstakenly researched the travels and travails of what may have been the first Bible with cantillation and vowel symbols. We learned that the codex was written in the 10th century A.D. and has long been considered to be the most authoritative document in the masorah (“transmission”), the tradition by which the Hebrew Scriptures have been preserved from generation to generation. One interesting feature is that Maimonidies used portions of it as a source for his writings. For many centuries this manuscript/Bible was carefully preserved by Jews from Aleppo. The last known intact copy of it was inspected by an Aleppo Rabbi living in Brazil. After that various pages and sections of the Bible were removed and /or literally stolen including parts of the Five Books of Moses. Currently what’s left of it is in a museum in Israel. The whole story is truly one of the great mysteries of all times. Learn more about the Book Club and what we’ve read in the past. This entry was posted in Book Discussion Group, Congregation News, Jewish Learning and tagged Book Group, Community event, Jewish Learning, San Francisco Jewish Congregation. Bookmark the permalink.